Tested and fine-tuned in K–2 classrooms, this book provides engaging lessons and materials for teaching the three genres of writing—opinion, procedural, and story—that provide a foundation for beginning writers’ persuasive, informative, and narrative writing skills. The authors' approach integrates strategy instruction, self-regulated learning, and dialogic interactions such as role-play. Packed with 69 reproducible planning forms and student handouts, the book makes connections between writing and reading in ways that support growth in both areas, address learning standards, and promote writing across the instructional day. Appendices contain numerous resources to support teachers’ and administrators’ professional learning. The large-size format facilitates photocopying; purchasers also get access to a Web page where they can download and print the reproducible materials. 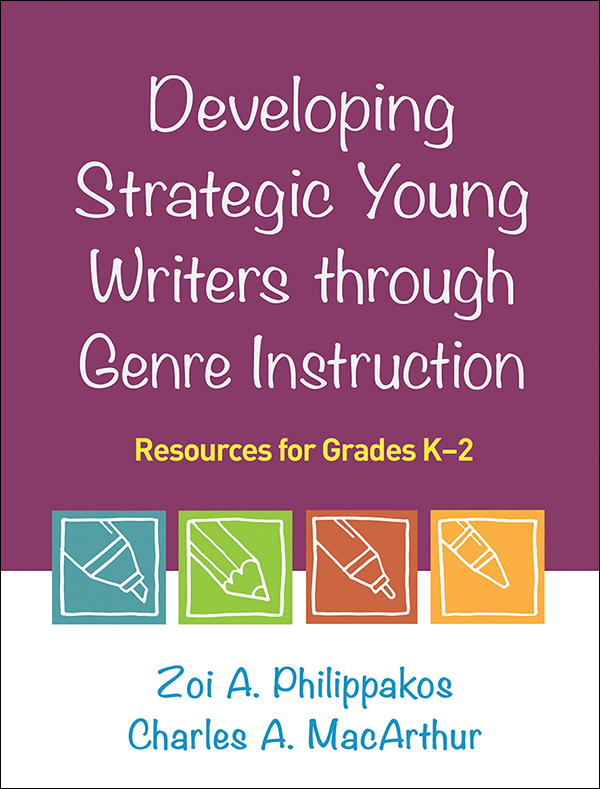 See also the authors' Developing Strategic Writers through Genre Instruction: Resources for Grades 3–5.